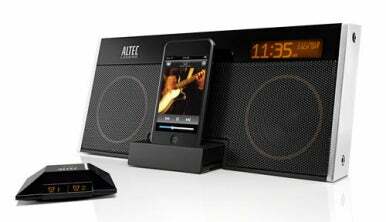 You wouldn’t necessarily think of the alarm clock as a technology category desperately in need of sexing up, but Altec Lansing would beg to differ. The company’s new Moondance Glow incorporates quality audio performance into a bedside unit that features sleek lines, touch-sensitive controls, and more. But while the unit comes with a hefty helping of features, it’s not without its share of quirks. The Moondance Glow might sound bulky at 12.25 inches wide by 5.25 inches high by 3.25 inches deep, but its angled lines mean that it takes up less room than you’d think. The front features a prominent speaker grille, a retractable Universal dock, and, in the top-right corner, a small LCD screen. Also included in the box are a detchable FM antenna, an AC power cable, a remote control, four adapters for the system's iPod dock cradle, and a wireless "snooze remote" and accompanying transceiver (more on this last feature below). The touch-sensitive controls are presented in a row along the top of the Moondance and appear more or less invisible until the unit is turned on, at which point they are backlit in amber. From left to right, the controls are Power, Source (toggles the audio input), Mood (for controlling a colored light on the back of the unit), Volume Down, Play/Pause/Snooze, Volume Up, Previous, Next, Alarm 1, and Alarm 2. On the back of the unit are ports for the snooze remote's transceiver, FM antenna, and power adapter, as well as an auxiliary-input jack for connecting another audio source. There’s also an LED mood light, a Clock button for setting the time and adjusting the LCD brightness, and a compartment for a 9-Volt backup battery (not included). The Moondance Glow's touch-sensitive controls are cool, but the novelty quickly wears off when confronted with issues of practicality. For one thing, the buttons are very difficult to tell apart without looking at the unit: except for a raised ridge on the front of the Play/Pause/Snooze button and slight grooves between the buttons, they feel identical. Even worse, because they’re touch-sensitive, if you trace your fingers over them to find the right button, you're likely to end up triggering the functions of the other buttons along the way. More than once, I found myself inadvertently cranking the volume when I just wanted to switch tracks on my iPod. And the lack of tactile feedback means you're never quite sure how hard you have to press to get the button to actually register a press. Moreover, the fact the controls are on the top of the unit means that in order to use the system from your bed, you either need to prop yourself up high enough that you can look at them, or tilt the whole unit towards you. This can be pretty frustrating when you’re trying to just listen to some music in bed, but it’s downright maddening when you’re trying to shut the alarm off in the morning. I’ve noted in past reviews the somewhat curious habit of manufacturers providing a remote control for an alarm clock—a device you usually use within arm’s length. Clearly Altec-Lansing was listening, for the company decided to give you two remotes with the Moondance Glow. In addition to the small conventional remote control, the Glow comes with a small, decapitated pyramid billed as a “snooze remote.” You plug a similar-looking transceiver into the back of the alarm clock and then pair the two by holding down a button on the bottom of the transceiver and pressing any button on the snooze remote twice. The snooze remote does only a few things. By pressing down on the whole thing—two of the little feet on the bottom of the snooze remote are actually physical buttons; it took me a while to realize that the unit wasn't touch-sensitive—you can either Play/Pause your music or snooze your alarm. There are also physical Alarm 1 and Alarm 2 buttons on the front of the snooze remote that allow you to deactivate the respective alarm. That’s the best feature of the remote—it’s actually much easier to turn off the alarms via the snooze remote than via the unit itself. (The latter requires you to find the correct alarm button and then hold it down for a couple of seconds.) The snooze remote is also also useful in situations where you have two people sharing a bed and each wants control over the alarms, though it also introduces the temptation for the later sleeper to shut off the earlier sleeper’s alarm (which, of course, isn't Altec Lansing's fault). The other remote, an infrared model, would be largely useless if not for the fact that it’s the only way you can set or use radio presets. There are four preset buttons, P1 through P4, which, in addition to letting you store and quickly tune to radio stations, are also assigned to _different_ features when you’re playing music on your iPod—totally non-obvious features that require a thorough perusing of the manual. For example, P1 shifts between song and album shuffle while P3 accesses the previous playlist. Lest these control issues make the Moondance Glow sound terrible, I have to note the good qualities. For one thing, the unit produces good sound for its size: there’s solid bass reproduction, clear midrange, and no distortion, even at higher volumes (and the unit can crank out some pretty high volumes). FM reception is very good, as well—among the better of the iPod "clock radios" I've tested. I did run into one issue where the Moondance Glow's alarm wouldn't sound, even though the system powered on at the appropriate time. Altec-Lansing swapped my test unit out for another and the replacement did not exhibit the same problem in my tests, so I chalked this up to a defective first unit. I also like that you can toggle through the display brightness settings, including turning the backlight off entirely, by hitting the Clock button on the back. There are also options for customizing what information the LCD displays, including the title of the song playing on your iPod and, if supported by your radio station, RDS tags that can tell you what program you’re listening to. There are plenty of other features, too, such as an adjustable sleep timer, customizable snooze times, and a somewhat nifty—if superfluous—“mood” light with sixteen different color settings from Aquamarine to Solar Flare (you can also just turn this light off, if you prefer). Despite my gripes about the Moondance Glow’s controls, the sound quality and variety of features make it an attractive option—as does its admittedly good-looking black-with-silver-trim appearance. The touch-sensitive controls are eye-roll-inducing at times, but you do get used to them. Overall, though, it seems like Altec Lansing spent a little too much time considering how the unit looks and not enough on how it works.